If you want a one-of-a-kind vacation, we invite you to come see the tropical islands of Fiji and the lush forests of New Zealand. Just five hours from Hawaii, ten hours from Los Angeles, and three hours from New Zealand, Fiji is a truly special place, while the mountains and cities of New Zealand meld together the old and the new. Combined, the islands offer dozens of ways to enjoy a one-of-a-kind vacation. Our New Zealand and Fiji vacation packages take the stress out of planning your trip and get you started on making memories for a lifetime. 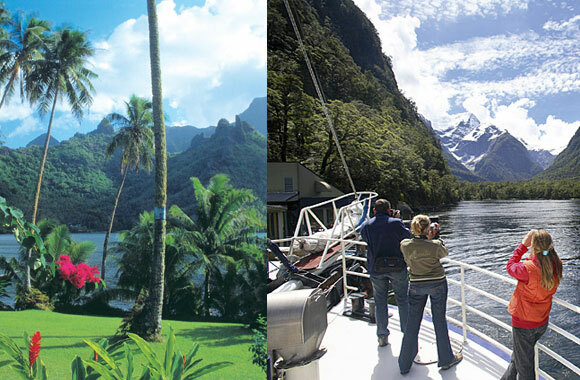 If you love nature, come to the islands of Fiji and New Zealand. From glaciers to beaches, mountains to plains, every type of landscape awaits you in one of our New Zealand and Fiji vacation packages. The nation of Fiji is a collection of 333 islands formed by ancient volcanos, perfect for geology buffs. White sand beaches and the Sigatoka Sand Dunes call to you, inviting you to stroll along the Pacific shores and leave the worries of everyday life behind for a while. Come view the Botanical Gardens of Thursten, or hike the Colo-I-Suva Forest Park. Bird lovers will thrill to watch warblers and orange doves in Fiji, or delight at the cuteness of the kiwi, the national bird of New Zealand, in one of the country’s bird sanctuaries. Adventures await you, whether you want to SCUBA dive through the stunning soft coral reefs, sail along the islands, or kayak in clear waters. The mild climates year-round provide the ideal winter escape when the snows start to fall in North America. 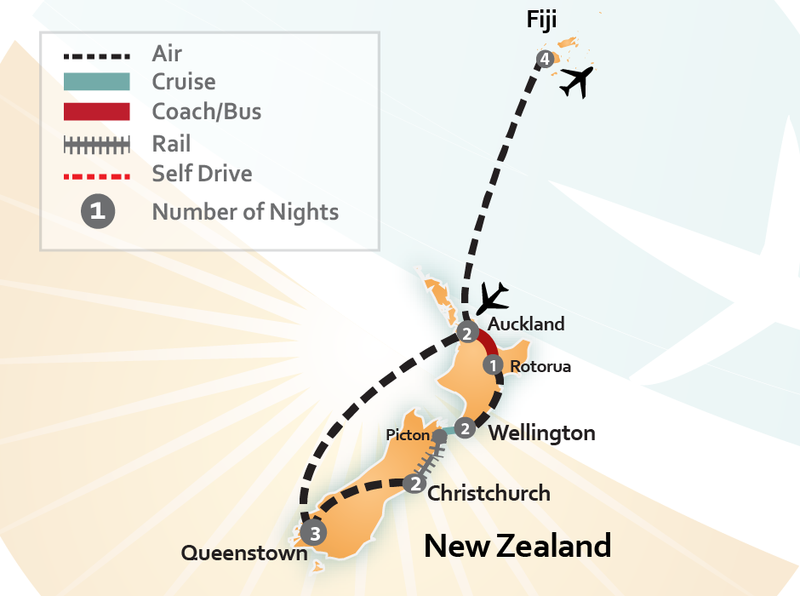 History lovers can take in the unique culture and rich history of the area in our New Zealand and Fiji vacation packages. The long human history of the Fiji islands dates back 4,000 years, and blends Fijian, Asian, and European cultures. New Zealand weaves Polynesian and European traits into a tapestry all its own. Your romantic side can delight in a day spa with a relaxing massage or a quiet dinner at an adult-only hotel. A private Fijian island can even be arranged so your honeymoon can be the most memorable trip of your lives. Both nations provide great escapes for the family. Book your New Zealand and Fiji vacation packages and choose from five-star hotels that cater to those who want the VIP treatment, while family resorts provide activities for children. You can also take in a rugby match, definitely the most popular sport in the area. The art and architecture in New Zealand is truly unique, and soft wool garments in unique shops are waiting to be taken home. 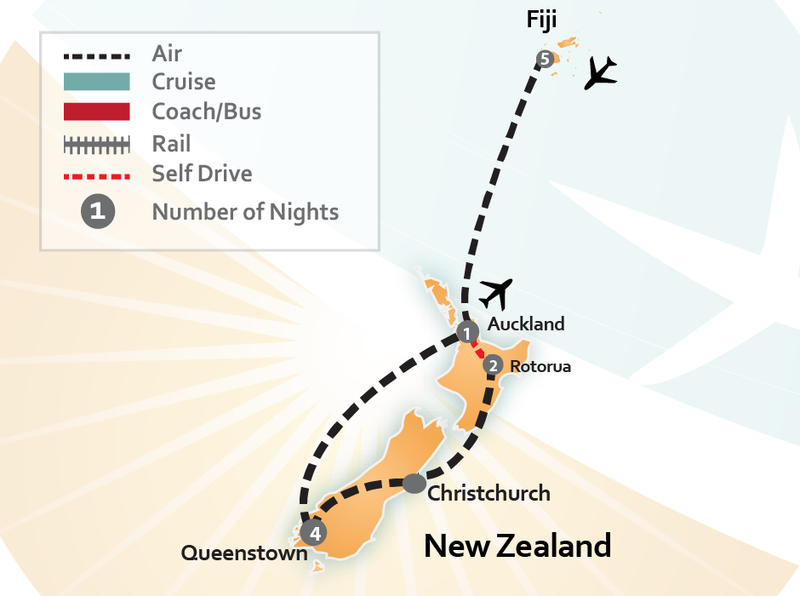 We hope you can take time to enjoy an unforgettable get-away with your family to the islands of New Zealand and Fiji. Whatever your reason, whatever the season, your ideal customizable vacation is just a phone call away, or follow the links below and start your adventure today. We can’t wait to hear from you!